In addition to mounting exhibitions that originate elsewhere, the curatorial staff and volunteers of Morven Museum and Garden come up with one original exhibition each year. In the past they have presented visitors to this historic mansion, once the official residence of the governor of New Jersey, with gorgeous scenes of the New Jersey Pinelands in the photographs of Richard Speedy, a groundbreaking exhibition on the artists of the New Jersey shore, and another on the itinerant New Jersey portrait painter, Micah Williams. With the oddly titled Hail Specimen of Female Art! New Jersey Schoolgirl Needlework, 1726-1860, they have pulled off one more coup. 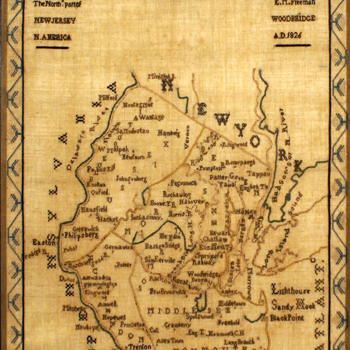 Featuring more than 150 works gathered from private collections, museums and historical societies, the exhibition divides New Jersey into five geographic regions and displays the silk on linen samplers in five corresponding galleries on the museum’s second floor. As the first such survey of its subject, it drew avid fans of the form, not only from New Jersey and Pennsylvania but from Texas, Oregon and Florida, to an all-day symposium at the Nassau Inn earlier this month. The show’s title comes from a line of poetry stitched by a Trenton teenager, Anne Rickey (1783- 1846), in 1798. The daughter of Quaker merchant, John Rickey and his wife Amey Olden, young Anne had relatives in Princeton and visitors are sure to discover familiar names here. Three Princeton girls are represented in the show and there are quite a number from Hopewell. The sampler belongs to the collection of Princeton resident Daniel C. Scheid who, along with Morven’s Elizabeth G. Allen, and the New Jersey-based collectors Dan and Marty Campanelli, served as co-curator of the exhibition. The Campanellis have authored a book on the subject focused on Hunterdon County, A Sampling of Hunterdon County Needlework: the motifs, the makers & their stories. Stephen and Carol Huber, whose writings include the books Samplers: How to Compare and Value and With Needle and Brush, have been specializing in samplers and girlhood embroidery for the last forty years as dealers, museum consultants, teachers and researchers. Their expertise encompasses the motifs and designs of samplers made in New Jersey, New England, the mid-Atlantic, and the South during the period covered by the exhibition as well as the ways in culture, society, art, and literature affected the designs. The idea for the show took shape over a year ago after several possibilities had been entertained and rejected. Someone mentioned needlework samplers. Had there ever been such a show? After some preliminary research yielded likely sources, this definitive needlework exhibition came into being. The exhibition features loans from across the country including needlework completed in every New Jersey county. Besides the historic and aesthetic merit of works ranging from simple to elaborate, one of the most interesting aspects of this exhibition is the glimpse that it gives of the lives, and especially the education, of girls and young women across the state during this time—what mattered to them, what interested them, as well as aspects of social class and familial status. The curators have brought together work by individual girls and their teachers to reveal schools of work. According to Allen, the co-curators set out to identify teachers and their New Jersey pupils. “Research into the motifs and designs employed by different instructresses uncovered previously unrecognized connections,” she says. In several instances, works by the same hand are displayed together alongside related pieces by sisters, cousins, schoolmates and other close relations; teachers are united with their pupils. Girls would often embroider the name of their teacher as well as their own name or initials. The comprehensive and highly informative exhibition catalogue will stand as a work of reference long after the show is dismantled and the samplers returned to their respective private and public collections in historical societies across the state, from Mercer to Cape May and Cumberland Counties. In addition to the New Jersey State Museum, lenders include The Metropolitan Museum of Art, the Colonial Williamsburg Foundation, Winterthur, the DAR Museum, the Frances Lehman Loeb Art Center at Vassar College, the Bergen County Historical Society, the Cape May County Museum, the Gloucester County Historical Society, the Holcombe-Jimison Farmstead Museum, the Hopewell Museum, the Hunterdon Historical Society, the Leslie Durst Collection, the Metlar-Bodine House, the Old Barracks Museum, and the Salem County Historical Society. This unique show might well bring about a revival of sampler art. Several children’s activities and a number of specialist talks coincide with the exhibition. Dan Scheid will discuss the significance of New Jersey schoolgirl needlework and related topics in “Collecting Needlework (And Other Things),” on Thursday, November 6, at 7pm; and Winterthur Museum Director Linda Eaton will address “The Material Culture of Needlework: Why it Matters,” on Thursday, January 29, 2015, at noon. Taking inspiration from a line stitched by Anne Rickey, Dan and Marty Campanelli, will present “So Education Forms the Mind,” on Thursday, February 26, 2015, at 1pm. Allen confesses to having tried her own hand at cross-stitch as a child, as did her mother, whose interest was sparked when her daughter was learning her ABCs, a common subject for needlework samplers. Now where did I leave my stitch craft dictionary? Hail Specimen of Female Art! New Jersey Schoolgirl Needlework, 1726-1860 runs through March 29, 2015 at Morven Museum and Garden, 55 Stockton Street. The fully illustrated exhibition catalogue is available through the museum’s Web site and in the Museum Shop. For more information including hours, admission, and related programs, call 609.924.8144 ext.106 or visit: www.morven.org. Arts Council of Princeton at 102 Witherspoon Street marks the 25th anniversary of the Princeton Artists Alliance with an exhibition of member work through November 26. Founded by Charles McVicker, the group has a current membership that includes Joanne Augustine, Hetty Baiz, Joy Barth, Anita Benarde, Zenna Broomer, Jennifer Cadoff, Rajie Cook, Clem Fiori, Thomas Francisco, Carol Hanson, Shellie Jacobson, Margaret Kennard Johnson, Nancy Lee Kern, Charles McVicker, Lucy Graves McVicker, Harry Naar, James Perry, Richard Sanders, Madelaine Shellaby, Marie Sturken, and Barbara Watts. A catalogue is available. Hours are Monday through Saturday, 9am to 5pm. For more information, call 609.924.8777, or visit: www.artscouncilofprinceton.org. James A. Michener Art Museum, 138 South Pine St., Doylestown, Pa: Out Of This World: Works by Steve Tobin through October 26; Wendy Paton: Nuit Blanche through December 7. For more information, hours and admission, call 215.340.9800 or visit: www.MichenerArtMuseum.org. Jane Voorhees Zimmerli Art Museum on the Rutgers campus in New Brunswick: Oleg Vassiliev: Space and Light through December 31; Jesse Krimes: Apokaluptein: 16389067 through December 14; A Place in America: Celebrating the Legacy of Ralph and Barbara Voorhees through February 8, 2015. For admission and hours, call 732.932.7237, ext. 610 or visit: www.zimmerlimuseum. rutgers.edu. ArtWorks Visual Arts Center, 19 Everett Alley, Trenton: The Third Annual Art All Day is a free celebration of creativity throughout the city of Trenton on Saturday, November 8. The event features open studio tours, popup galleries, trolley cars to connecting sites, bike tours, live demonstrations, as well as art and history talks. For more information, contact: 609.510.8836 or artallday@ artworkstrenton.org.